Halfmoon Road was in decent condition (2014), however it is not an interstate highway. Drive slow and slow down. Respect other vehicles and walkers and runners who are also using the road. The parking area was a bit rutted, but still would hold 50 vehicles. Of course, at times the parking area does not provide adequate parking for the number of vehicles. Elbert Creek Campground is across Halfmoon Road from the trailhead. Halfmoon Campground is a bit further down the road. Dispersed camping spots are also available along the road. When we visited the privy at the trailhead, it was full of trash. It was essentially being used as a dumpster. I felt sorry for the Forest Service worker who had to cleanup after the disrespectful users. The privy is a great facility. Please clean up after your use and take out all of your trash. There are no trash disposal services available at the trailhead. 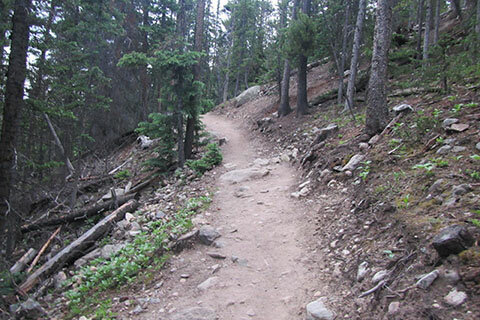 The first section of the route that follows the Colorado Trail is relatively new. We tried to find when it was rerouted, but had no luck. Regardless of when the change occurred, the new route is about 0.30 mile longer than the previous route. The extra distance is used for switchbacks. They ease the grade of the slope. Many of the older maps and guides do not include the rerouted trail. The intermittent creek that is crossed shortly after joining the Colorado Trail is the only source of water on the route. 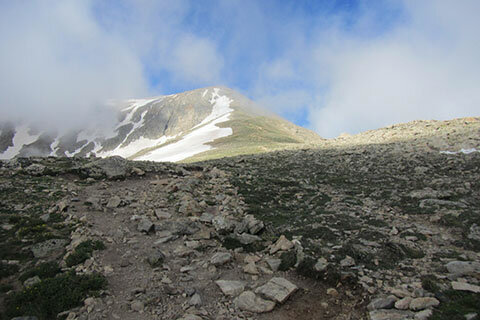 After turning onto the North Elbert Trail, the route gets steep. The 'opening' is a good place for a mini-break. Above tree-line, the path switchbacks to the Northeast Ridge. Once on the ridge, the route gets steeper as you climb. Above tree-line it may be windy and much colder than below. Don't be surprised, pack extra clothing. Looking to the south (left) from the Northeast Ridge, you see the East Ridge Route and Box Lake between the two ridges. There are a couple of false summits on the route. Just above 13,500 feet the trail is not in good shape. The trail is steep and eroded. Please stay on the hardened path. After climbing to the Upper Ridge, it is still about 500 feet to the top. The trail climbs for about 0.25 mile. Once on the ridge crest it is an easier grade to the summit. Make an alpine start to avoid a crowded summit and afternoon thunderstorms. Check the hourly weather forecasts. Know how fast you can walk at the grade and elevation of the intended trail. Estimate the time you should reach the summit and then return to tree-line. Start early enough to provide a margin of good weather. 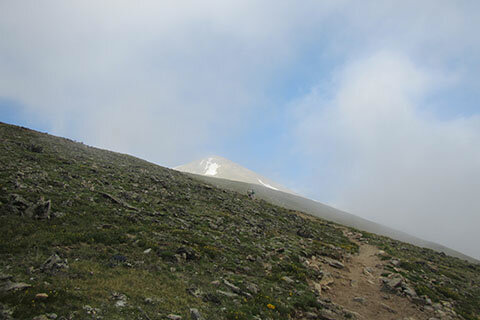 Every hike we have made on Elbert we have seen a disproportionate number of struggling hikers. 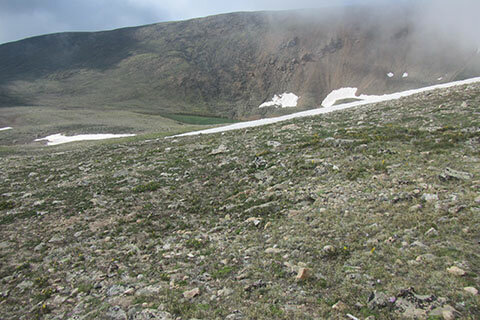 Elbert may not be technically difficult, but it is a steep 14,000 feet climb. Respect the mountain. Train and acclimate before attempting the climb. The link opens in a new window.